Bonadea II has been working for over twenty-five years in sailing with passengers to view whales and dolphins. The company’s aim is to show its guests cetaceans in their natural habitat and to satisfy them with a fantastic cruise along the southern coast of Tenerife. The crew is very experienced in the handling of watercraft and viewing whales and dolphins. The catamaran, Bonadea II, has a licence to sail with up to twenty-two passengers plus crew. It is the holder of the “Barco Azul” flag, meaning that it is authorised by the Regional Ministry of Tourism of the Canary Islands Government for the activity of whale watching. 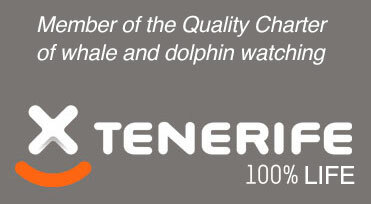 It also has the authorisation of the Ministry of the Environment for observing cetaceans, and what is more it holds the quality card of Turismo de Tenerife. The crew also carries out Ocean Cleaning by collecting marine refuse (plastics) and participates with the La Tahonilla wild fauna recovery centre belonging to the Tenerife Island Authority or Cabildo to rescue marine fauna in difficulties.